Last modified on August 30th, 2015 by Joe. PropertySource is an abstract base class that represents a source of name value property pairs. @PropertySource is an annotation for declaring a PropertySource to Spring’s Environment. Spring 3.1 introduced a new annotation @PropertySource to declare a property source to the Spring Environment. That is to use property values configured in external files like *.properties, *.txt etc in application. Spring 4.0 has updated this @PropertySource annotation by adding one new property to work with some failure cases. That new property is “ignoreResourceNotFound”. It is always better to store the configuration informations in a properties file instead of maintaining it in the Java file. Let us learn about configuring property source in pre Spring 3.1 project. There are mainly two approaches to configure properties. Use PropertySourcesPlaceholderConfigurer class to configure properties files in Spring Beans XML configuration file as shown below. Step 1. 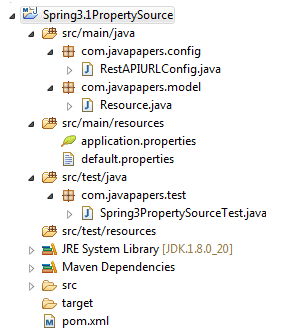 Define application.properties at “/src/main/properties” folder in Mavenized project. Step 2. Configure application.properties file using PropertySourcesPlaceholderConfigurerclass in Spring Beans XML Configuration file. Step 3. Access REST API URL using Spring Expression Language(SpEL). Use <context:property-placeholder> tag in an XML configuration file. Steps 1 and 2 above are same and the way we define in configuration file is different. From Spring 3.1 we can go the annotation way to configure properties in Spring as it is convenient to use. @Target(value=TYPE) means we can use this annotation only at Class level. We cannot use this for Field level, Method level and Constructor level. When We define property files using “classpath” as shown in above examples, it searches that file at project classpath and resolve all values. When we define multiple property files using @PropertySource annotation, then order of those files is very important. For instance, take above example. If we define same property(key-value) pair in both default.properties and config.properties files, then config.properties overrides default.properties value. Define our application properties file with all REST EndPoint URLs. 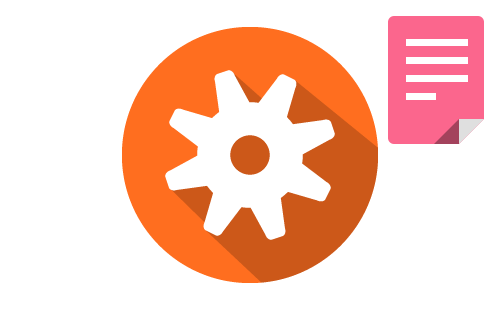 Assume that we have one external system which exposes REST API for our applications. In real-time applications, we know that we use different URLs for different environments. In DEV or Unit Testing, we may use local or mock REST API to ease development. For that one, wewill use one default.properties file. Our main intention is that if a required property is available in application.properties file, then use it. If not available, then our Application should not throw any error. It should use default value available in default.properties file then interact with REST API. Here intentionally, I have commented all properties in application.properties file. We need to uncomment one required property as we move from DEV to QA to PRE-PROD to PROD environments and use that property value to interact with External REST API. We will write some unit tests to test them. RestAPIURLConfig class configures two property files at class level. It uses @Value annotation to assign value to restAPIUrl property. We have written a method propertyConfig() to create an instance of PropertySourcesPlaceholderConfigurer class. Like Spring 3.0 or earlier versions, we need to create an instance of this class to configure our properties. Spring3PropertySourceTest class configures “RestAPIURLConfig.class” as shown below to get our application configured beans to unit test them. As we have commented @Ignore annotation for testDevResource() method and uncommented for testDevResource() method , we can test DEV REST API. Please run this Junit in your Java IDE and observe the results. By observing this screen shot, we can say that it executes testDevResource() method only and ignores testQAResource() method because of @Ignore annotation. If we observe Spring 3.1 @PropertySource example, we have used two property files: default.properties and application.properties. We know our main intention. If our required properties are available in application.properties, then use them in our application.If not available, then use property values from default.properties file. It proves our assumption as false because our Junit still should work with default properties available in default.properties file. But it is throwing an error. To see this error in our application, just delete application.properties file from “/src/main/resources” folder (Before deleting this file, please take a backup into your local file system) and run JUnits. Spring 4.0 has provided one improvement to this annotation to avoid these errors. Spring 4.0 Framework has introduced the following improvements to @PropertySource annotation as improvement over Spring 3.x Framework features. We will look into these Spring 4 @PropertySource annotation improvements one by one with examples. Aside from Lambda Expressions, Stream API, Default & Static Methods in Interface, Date & Time API etc, Java SE 8 has introduced one more new feature: Repeatable Annotations. Spring 4.0 has added new @PropertySources annotation with the following definition. Spring 4.0 @PropertySources annotation is used to define an array of one or more @PropertySource annotations. That’s why it is also known as a Container Annotation. To avoid “java.io.FileNotFoundException” exception just before seen in Spring 3.1 example, Spring 4.0 had introduced a new boolean attribute “ignoreResourceNotFound”. It accepts true or false. Default value to this attribute is false. If that resource or property file is not available in application classpath, it does not throw “java.io.FileNotFoundException” exception. It just ignores that declaration. If that resource or property file is not available in application classpath, it throws “java.io.FileNotFoundException” exception. As “false” is default value to this attribute, it is similar to without using this attribute. We will use same steps and files from “Spring3.1PropertySource” project and will discuss only few steps which are new in Spring 4.0 Project. As Java SE 8 supports Repeatable annotations, we don’t need to use @PropertySources container annotation type. We can define same @PropertySource annotation multiple times. Comments on "Spring Properties with @PropertySource Annotation"
Is am doing any wrong here Joe? Comments are closed for "Spring Properties with @PropertySource Annotation".